The Departments of Treasury and Housing and Urban Development (HUD) released the August edition of their Housing Scorecard on Friday which painted a picture of slowly increasing home prices and decreasing foreclosures while delinquencies increased. The Scorecard, issued jointly by the Departments of Treasury and Housing and Urban Development (HUD) is largely a recap of data released by other sources such as the Census Bureau, S&P Case-Schiller, RealtyTrac and the National Association of Realtors. Much of the housing data is information that we have previously covered. The Housing Scorecard includes by reference the monthly report on the Making Home Affordable Program (MHA, formerly known as HAMP) which is augmented this month with detailed assessments of the 10 largest mortgage servicers participating in MHA. Much of the criticism of MHA, which started in April of 2009 as a joint initiative of HUD and Treasury, has centered on the performance of mortgage servicers. They are responsible for identifying delinquent borrowers who are potential program participants, contacting and qualifying them for a three-month trial program and then converting those borrowers who successfully complete the trial into a permanent loan modification. Servicers have been faulted for failing to appropriately qualify borrowers, losing documents supplied by the borrowers, failing to communicate with clients, and extremely long delays in converting borrowers or failing to convert them at all. Treasury and HUD have been attempting to improve servicer performance and recently named Freddie Mac as compliance agent for the program. Freddie has created a separate division, MHA-Compliance (MHA-C) to evaluate a range of servicer activities for compliance with MHA guidelines. Servicers are evaluated on three performance criteria; identifying and contacting homeowners, homeowner evaluation and assistance, and program management, reporting and governance. In addition, Freddie Mac looked at such criteria as the length of time homeowners spent in various stages of remediation and the servicers' handling of documents. Servicers' performance was evaluated in comparison to the best servicer performance and the worst servicer performance for each metric. In June, the first time the assessments were made public, all ten of the major servicers were found wanting and four were identified as needing substantial improvement; three of those, J.P. Morgan Chase Bank, Wells Fargo Bank, and Bank of America had financial incentives withheld for the first quarter of 2011 and until the specified improvements were made. The current assessment report, covering the second quarter, still found problems with the operations of every servicer. Two servicers needed minor improvements, and five, including Wells Fargo, needed moderate changes. J.P. Morgan and Bank of America were again found to be in need of substantial improvements and second quarter incentives have been withheld. Bank of America, for example, was found to have the worst performance of all servicers in three of four metrics; its conversion rate, the average number of calendar days required to resolve escalated cases, and the percent of missing modification status reports. J.P. Morgan performed well below par on two of the four metrics. "While tens of thousands of additional homeowners benefit from the Administration's programs each month, we need to keep the pressure on servicers to effectively assist those homeowners who are still struggling and eligible for assistance," said Treasury Assistant Secretary for Financial Stability Tim Massad. "These assessments provide an unprecedented level of information about servicer performance and are designed to help more eligible homeowners walk away from this process with better results." MHA also reports that it has completed 28,328 permanent modifications since the June report for a total of 791,399 over the life of the program. An additional 22,079 trials have been started for a total of 1,892,006 and 106,078 borrowers remained in trial status at the end of July. The average length of the trial period for those who convert to a permanent modification has decreased from 5.3 months for trials started before June 1, 2010 when the program underwent substantial revision to a duration of 3.5 months for trials started after that date. 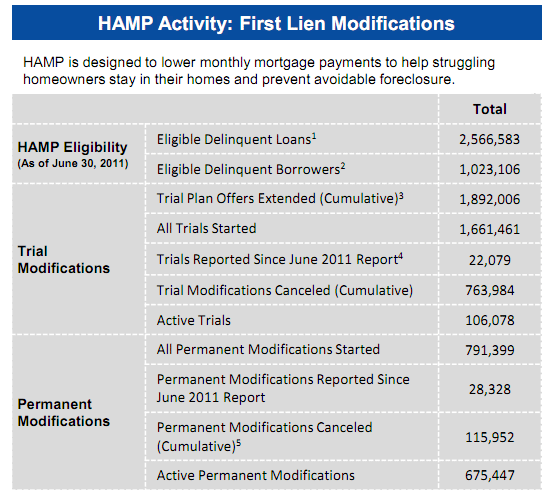 The Second Lien Modification Program which provides assistance to homeowner in a first lien modification program has now completed modifications on 32,172 second liens and partially extinguished 1,356. Home Affordable Foreclosure Alternatives offers incentives for homeowners who wish to exit their homes through a short sale or deed-in-lieu of foreclosure. It has now effectuated 12,514 short sales and 374 deeds-in-lieu out of 25,716 homeowners who have entered the program.